We share an excerpt from a blog post written in 2010 by Chris Courtheyn, former FOR Accompanier in the Peace Community of San José de Apartadó and current member of our Board of Directors. Two years ago, the first major event I accompanied as an FOR volunteer in Colombia was the Peace Community of San José de Apartadó’s “return” to the veredas of Mulatos and La Resbaloza. (A vereda is a small rural district of dispersed rural settlements.) The farmers living there had originally been displaced in 1996, along with thousands of others throughout the country’s northwestern Urabá region, when paramilitaries swept the area in an attempted takeover of territory. The Peace Community began to return to these veredas in 2004, only to suffer the horrendous massacre, attributed to an army and paramilitary operation, of eight of its members on February 21, 2005. Three years later, the Peace Community attempted to return once again. I remember vividly my first trip to Mulatos, on February 19, 2008. I had only a week earlier arrived in the Peace Community for the first time. The five-hour walk through hills and riverbeds to Mulatos from the settlement of La Unión where FOR’s team lives was brutal on my body, exhausting my legs and knees. Arriving at the site of the 2005 massacre, there was nothing more than a small chapel in what seemed the middle of the bush. In fact, this space to where community members had returned in 2004 was now totally overgrown with tall grasses. The area was subsequently cleared and prepared for the events that would take place two days later: a mass at the massacre site in Mulatos, and a commemoration event honoring those killed in La Resbaloza. Fast forward to 2010. The area that only two years ago was overgrown with weeds is now a settlement of its own: the Peace Village of Mulatos. 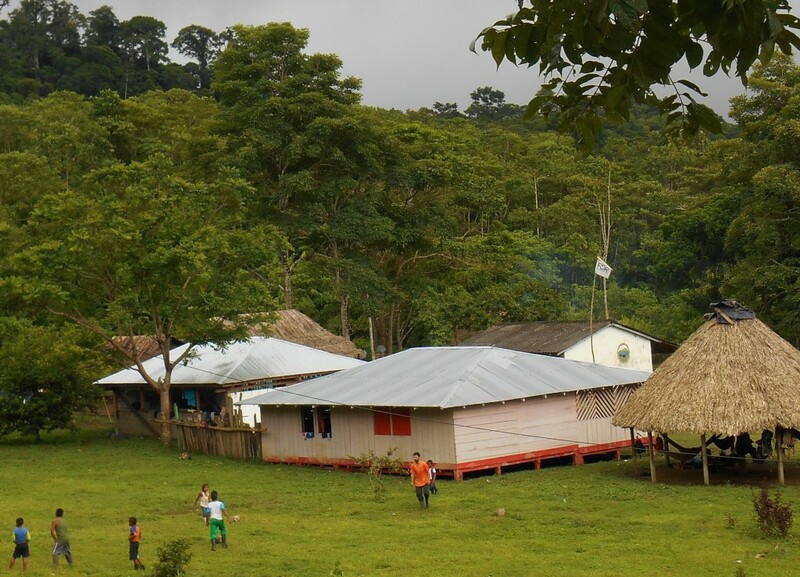 In the proceeding weeks, Peace Community members from other veredas such as La Unión, La Cristalina, Alto Joaquín and Las Claras, had come to build the village. The new constructions were numerous: kiosks and homes, a kitchen and a dining hall, toilet and shower stalls. Hundreds of people participated in the week-long commemoration of the 2005 massacre. Peace Community members were joined by representatives from other communities, such as indigenous Colombians from Cauca and Chocó, as well as internationals from Italy, Austria, France, Brazil, and the United States. Community families have now returned to over ten veredas since its founding in 1997. Mulatos is emblematic of the community’s process, illustrating the constant obstacles it faces, where attempts to return are stalled through massacres and threats. Today, guerrillas, paramilitaries and army soldiers continue to pressure these farmers to submit to their command or to flee, yet the community remains vigilant and vows to return to and work their lands no matter how long it takes. People expressed these feelings of togetherness and hope two years ago. Even more powerful is the extent to which the Peace Community has built upon this solidarity since then. A place where five years ago lay blood and dismembered bodies is now a peace village of remembrance and resistance.